Perlick 525 forward seal faucets are great. The forward seal reduces sticking in the lever, reduces bacteria growth in the faucet, and generally offers a smoother pour than a standard faucet. Unfortunately, many owners of the 525 series faucets have experienced leaking, which has caused much frustration. Perlick offers a rebuild kit, but many users have reported that the rebuild kit only fixes things temporarily or sometimes the rebuild kit doesn’t resolve the problem at all. I’ve rebuilt 6 Perlick faucets, three I bought new that leaked for me, and three more that I believe were leaking when I bought them second hand. None of them leak now. Here’s how to repair yours. To fix either type of leak, the first thing to do is to disassemble the faucet. The National Home Brew Channel on Youtube has a good tear down and assembly video, but a word of caution, only use this as a reference to take apart and reassemble the faucet. Don’t use lubricant when assembling and don’t use the rebuild kit like they do in the video. Read on for the best way to repair these faucets. 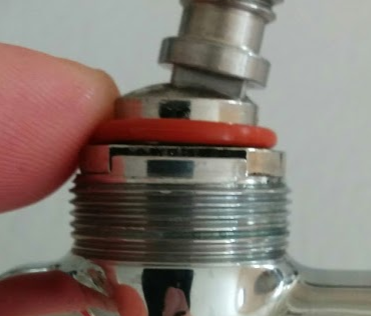 If you don’t have an o-ring pick, you can get the forward seal o-ring out by using a toothpick or the threaded lever from the faucet and inserting it through the spout and pushing the forward o-ring out the back. Once you have everything apart, mix up some standard strength PBW or oxiclean and soak all the parts, including o-rings, for several hours, or however long it takes to get any and all beer, beer stone, keg lube, grease, mold, gunk, etc. off. They need to be spotless. If needed use a q-tip to scrub the inside. Use dish soap if you need to, just rinse with Star-san to remove any residue. You’ll notice how clean the faucets are in the following pictures. This is critical for this to work. See where the red arrows are? That’s where the buna-n orings are deformed and I’m pressing down with my finger to exaggerate it a bit. This is a demonstration of what happens when the bonnet is cranked down and those gaps are where the leaks come from. How do we fix that? With Silicone O-rings. The dash number is 014 and you can get them anywhere Silicone O-rings are sold. That link is to a pack of 10 on Amazon and helps support In Bounds Brewing. They also have packs of 100. You can see it doesn’t deform. In order to keep it from deforming, you should only barely tighten the bonnet down. Barely finger tight is all it needs. Over time, I suspect that the silicone rings can become deformed and leak, especially if you really crank down on the bonnet, but so far, this is working for me for well over a year. There are actually two bonnet o-rings, one upper and one lower. The lower one will be visible if you remove the lever and the bearing cup. It’s the same size as the upper and you can use a toothpick to get it out. The red arrow is pointing to the lower o-ring groove in the next picture. When you put the new one in, you can flex it like this and then pop it into place fully seated in the groove. Spout leaks are a little more difficult to diagnose, especially for me because I’ve only had one spout leak. Here is the seat for the forward seal. The blue arrow is pointing to the top of the top of the retaining groove for the forward seal. The groove does not run the whole circumference of the seal, and the seal is pretty loose in the groove. The purpose of this is so that the perl ball can seal against the o-ring on the back side and then the pressure of the beer will force the o-ring into the sealing face in the front of the faucet. 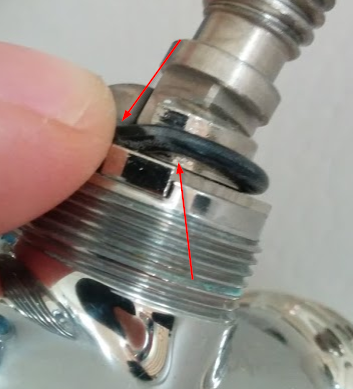 The green arrow is pointing to this sealing face, you can see it runs the full circumference of the faucet. 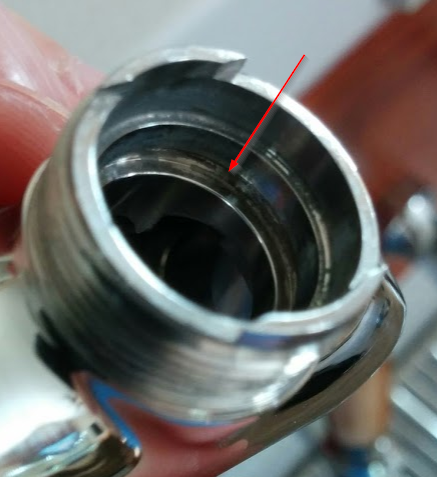 This is the only seal involved in preventing beer from exiting the faucet, so if the faucet is leaking, there is either a problem with the ball making a seal with the o-ring or the o-ring making a seal with the forward face. Here is a cut away diagram from Perlick of this sealing action. I added green arrows to show the seal on the forward face and orange arrows to show the seal with the perl ball. Perlick advertised this forward o-ring as a “Revolutionary Floating O-ring.” Which is true, it’s pretty unique, but the problem is that if even a little gunk gets built up between the forward face and the o-ring, it will have a hard time sealing. This means that even things like keg lube can cause leaks. This was the fix for my forward seal leaks. Just cleaning. I have not replaced the forward o-ring in any of my faucets. If you get that face and the o-ring super clean and the o-ring is not deformed or damaged, it should seal fine. I haven’t tried a silicone o-ring for the forward seal, and I’m not sure it would be best either because that o-ring does need some pliability to float and squish a bit just from the pressure of the beer. If you have tried a silicone o-ring in the forward seal, let me know what size you used and how it worked for you. Update 5/9/2018: I finally had to replace one of my forward seal o-rings. I used a dash number 204 Silicone O-ring and it has been working well for about 6 months now. Assembly is pretty straight forward. You’ll notice some foam in the picture of the forward seal above, and that is just Star-san. I spray everything with Star-san as I assemble it. It acts as a tiny bit of lubricant to make the parts go together better and it makes sure everything is clean and sanitary for final assembly. That’s it, no keg lube or other lubricant is required. The beer touches all the parts that really need to move and it will lubricate those while in use. Make sure not to tighten the bonnet too tight and check to make sure everything is moving smoothly and you can install it in your kegerator. Maintenance is pretty simple once you have these faucets functioning properly. Just recirculate some BLC (Beer Line Cleaner) followed by water then Star-san and the faucets will be humming along. If you get any sticking at all, disassemble, clean, and replace the o-rings as needed, but this should only need to be done once a year or so. I only do a recirculating line cleaning but once every 3-6 months. To me, cleaning lines 2-4 times a year and cleaning faucets once a year is an acceptable service interval. Hopefully that helped you repair your faucets and you’ll love your Perlick 525PC or 525SS as much as I do. Update: I recommend Silicone O-rings throughout this article, as that is what I use. It was brought to my attention that silicone o-rings have a lower wear resistance and a lower tear resistance than Buna-N, which may be the reason Perlick chose Buna-N over Silicone. I’ve yet to have an issue with either of these things with my Silicone o-rings, and the excellent compression set resistance of Silicone is what prevents the leaking compared to Buna-N having good compression set resistance. I’ll spare you the technical details, but it appears that Viton may be a best of both worlds option if you are in a heavy usage scenario as it has good wear resistance and excellent compression set resistance. The only downside is you have to specifically find a food grade or FDA Viton preparation as not all Viton is food safe. The Oring Store has food grade Viton 014 orings. I haven’t tried using Viton, so I can’t endorse it, but it might be something to look into if you need high wear resistance. I doubt many home users would fit a scenario that would need that sort of wear resistance. Did anyone ever respond with forward seal sizes for you? No, I never heard back on those.